Got Junk? Purge It, and Feel Free to Be Ruthless! This school year is all about starting new rituals apparently. I already posted about writing a letter to Zach before the first day of school. From now on, we’re also going to do a Beginning-of-the-school-year Purge. Six years ago we remodeled our house and installed beautiful, stain-resistant beige carpet. We then proceeded to bear two children who made a point of projectile vomiting. Zach even learned how to get himself so worked up that he could throw up at will (we were SO proud). My husband has been talking about cleaning the carpets for years, and last week he finally did it. He moved everything off of the carpet, rented a Rug Doctor* from the local hardware store, sprayed the really nasty stains (there were dozens), and washed the carpet. I “helped” by immediately leaving and keeping Zach out of the house after school. The cleaning products weren’t that smelly, but it was freaking me out seeing all of the piles of stuff around the house. It was depressing seeing them before, but having it all out in the open and not be being able to deal with it was too much for me. The next day, while the kids were at school, my husband and I sorted the stuff: 1) to donate to friends who have younger children, 2) to recycle (almost every single piece of paper we found), 3) to throw away, and 4) to donate to Goodwill. We kept repeating the mantra, “Be ruthless.” I threw away cards my husband had given me for our anniversary, we threw away three dioramas Zach had made for school (we had already photographed them, and gotten his permission), and gave away some things the kids had recently gotten as birthday presents but weren’t very interested in. I packed a duffle bag that I now call my Exercise Bag of Shame, which included gear from doing aikido, Zumba, weightlifting, cardio kickboxing, and Wushu. I’m only joking about the shame. I’m glad I’ve tried different types of exercise. One day I might go back to some of them, but it’s better for the bag to be out in the garage. We still have books and a few piles in our office to go through, but I can walk into my walk-in closet again, our carpets are mostly beige instead of black, and Zach’s room looks a third bigger now. When I look around our house I feel lighter, calmer, and proud of what we accomplished. I worried that Zach would be upset about all the stuff we got rid of, but he was totally fine. We realized this is a great time to get rid of stuff because he’s so excited about the new school year, he’s happy to let go of last year’s stuff. How do you control the chaos of clutter in your home? *I do not receive any compensation for any products I mention on this blog, but I will be happy to entertain any offers, especially if they are filled with wine and/or chocolate. I remember the first time I heard about donating blood. It was in my government class in junior year of high school. My teacher promised extra credit to students who could beat his donation time, i.e., the time it took to donate a pint of blood. I wasn’t eligible at that time, but it was my first exposure that I was carrying something around every day that could save lives. I stopped while I was pregnant both times and while I was nursing, but now that my body is more or less mine again, I donate blood every eight weeks. If you are interested in donating blood, but don’t know where to go, click to find local Red Cross. I understand that some people may be concerned that donating blood hurts. To me, it feels like a hard pinch, considerably less painful than giving birth, being head-butted by my daughter, or stubbing my toe. There’s usually free water, juice, and cookies. In the past I’ve also gotten a free AMC movie ticket, coupons to local restaurants and stores, and free T-shirts. Organize a blood drive with your church group, book club, mommy group, etc. I will be turning 40 years old in a few months. I would be honored if people would donate blood (or money, or time, or publicity for a blood bank). There are over 16 weeks until the end of the year, which means those willing could donate blood twice in that time. Would you be willing to donate in some way to a blood center by the end of this year? Zach started first grade today. This morning I read him a letter I wrote to reflect on my hopes and expectations for the school year ahead. I got the idea from a blog post on The Four Wendys. Today you’re starting 1st grade. I’m so excited for you for all of the great experiences you’re going to have. You’re going to spend time with friends you made last year and make new friends. You’re going to learn more about the subjects you already love like math, science, and dinosaurs. You’re going to feel more comfortable reading and writing, and hopefully, you’ll really start to enjoy them as much as I do. There will be times that aren’t so fun. There will be a lot of hard work. There will be times you won’t get along with some of the kids. Sometimes people will use harsh words or play too roughly. Sometimes that person will be you. We’ll work through it all together, reminding each other to use kind words and have peaceful bodies. You are very special. You are the only one of you there is or will ever be. I’m really grateful to be your mom. You are a very important member of our family. It’s also good to remember that you’re not the only or the most important member of our family, or your classroom, or your friends. We are all valuable members of our community, and we need to take care of each other. You have grown so much just in the last few months, not just your height, but in your kindness, your patience, and your creativity. I’m looking forward to watching you learn, teach, and share all the gifts and ideas you have. I love you, I appreciate you, and I bless you, for you are God’s perfect child. God and I love you just the way you are. 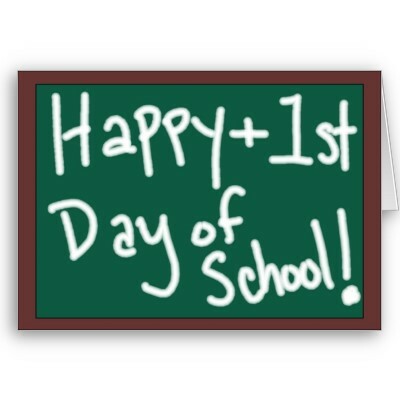 What are you most looking forward to or dreading this school year? I had a great yoga class this morning. So great that I blatantly ignored the instructor’s suggestion to have a nutritious meal, and got donut holes from the place next door. I only wanted maybe two, but there was a dozen minimum, and because I only had a credit card, I needed to spend at least $5. I decided to buy a bottled mocha Frappuccino to reach the minimum. It added up to $4.75. I told the guy to charge me $5, and he said it wasn’t necessary, and he couldn’t anyway because the cash register wouldn’t balance at the end of the day. I was committed to being generous, damn-it-all-to-hell, so I insisted on adding the $0.25 to the credit card receipt. I thought I was being so generous, and just now I calculated it to be 5%. Now I feel a little like a chump. Anyway, here I am with a dozen donut holes, and I’m still dripping sweat from my yoga class. I decide this is the perfect time to transform into my alter-ego Miss Hospitality. Like the people behind the “Free Hugs Campaign” (here’s a YouTube video), I decide to offer my excess donut holes to strangers. This was surprisingly harder than I expected. Maybe it was because I was wearing a yoga outfit and kinda stinky, maybe they thought the donut holes laced with something, or maybe people are just so darn health-conscious these days (“damn commies” as my former aikido teacher would say). Very few people took any. Three people, in fact. I was so caught up in being generous, being the sweaty crazy lady giving away smiles, hopefully a laugh, and a bunch of empty calories, I didn’t notice right away that I had put my yoga mat and towel, my water bottle, my cell phone, and my ice-cold mocha Frappuccino bottle in the car, along with my keys and locked them all inside. I used the donut store’s phone to call my husband to have him bring the second set of keys to our truck. I realized I could get all perfectionist and feel foolish for trying to be so friendly, but I decided to just sit in the donut shop while I waited, and I ate six of the donut holes. Hey, I figure six donut holes probably equals one whole donut. How are you going to spread a little hospitality, generosity, or friendliness today? 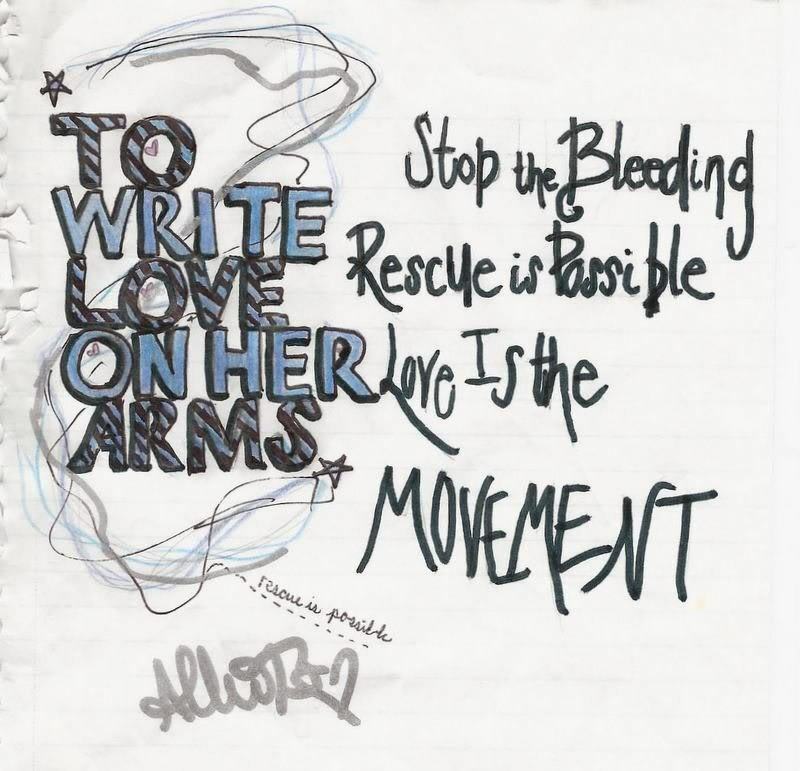 I’ve added a link on the “Where to Get Help” page to To Write Love on Her Arms. I first heard about this organization from a fellow patient at the psychiatric ward I stayed in during my second pregnancy. The woman, whom I’ll call Gabi, suffered from anorexia, depression, and anxiety, and she coped by cutting herself. She would cut herself in lines along her leg to comfort herself when she was feeling stressed out. She prided herself that she always sterilized the knife first, so that she wouldn’t get an infection. I suppose doing things to one’s body, whether it’s eating only 100 calories per day, as Gabi did, or cutting the skin with a knife or with the fingers, is an attempt at feeling in control. It’s certainly a temporary distraction from uncomfortable or negative feelings. When I kept staring at the blank screen before starting to write this post, I found myself clawing at a scab on my chest. It temporarily eased the frustration of not knowing what to write, worrying that no one will ever care about what I write, and fearing that I will never be a good writer. I feel ashamed of the scars on my face. I’m almost 40 years old, but my face has more acne scars than when I was a teenager. I blame myself because I eat too much refined sugar. I imagine if I were a vegan yoga fanatic, my skin would be flawless. I did go to a dermatologist once who prescribed a retinoid cream and a mild antibiotic. I used them for awhile, but they didn’t seem to help. One of the reasons Gabi was hospitalized was because she noticed her five-year-old daughter was starting to make comments about thinking she was fat and wondering aloud how many calories were in a food she was considering eating. Gabi realized her daughter was picking up on her anxiety about her weight, and she felt like a horrible mother and wanted to commit suicide. I know that if I want my daughter to have a healthy body image, I have to model it for her. I’m honestly not sure whether I can, but I realize I need to try. She’s only three years old, but she’s already into princesses. I imagine it won’t be long before I’m telling her she’s not allowed to go out of the house until she’s “properly dressed,” and she’s not allowed to wear makeup until she’s 18 (maybe 16). Every stage of my kids’ childhoods feels like it gets harder. Some things get easier, but I keep finding new baggage of mine I need to unpack and toss. I found these helpful tips of how to stop hurting myself. I’ve put it in my bookmarks bar in my browser. I’ll publish this post as my first step in “confiding in someone.” I’ll try to look at my skin and think of my daughter. I would never scratch up her skin, I don’t need to do it to mine. Do you have unhealthy coping mechanisms that you’d like to stop doing or you’ve been able to stop doing? My son Zach has been crying at night sometimes, saying he wishes his Grandma Shirley were still alive. She died a year and-a-half ago at the age of 82. He usually then asks when my husband and I are going to die. We decided to use this as an opportunity of getting him to come hiking with us, since as we tell him, it’ll help us live longer. We found the trailhead, and debated whether to take one of the maps with us. This ended up being a pretty important decision. We walked out to a pond, which a friend had already warned us was dry. Then we continued on what I thought was a path that would loop around back toward the parking lot. At some point, I forgot which trail we were on and which direction we were facing. There were signs, but one of them was a loop trail, and it crisscrossed another trail. I decided to head back on a trail we hadn’t been on yet because it would be more interesting than covering ground we’d already traveled. We walked, and walked, and walked. Zach started to complain that his legs hurt. Then he started to say he was “dying.” I of course paid no heed to his whining. Then he said he was feeling dizzy. It was warm, but not terribly hot. We did stop a couple of times to have snacks and drink water, but we did seem to be walking considerably longer than I expected. Finally, we started walking toward a reservoir that we should have been walking away from, and I realized we had walked 0.6 mi in the opposite direction we were supposed to be going. Thankfully, this trail was ending at a road, and it was obvious the only thing to do was turn around. If there had been a wrong turn available, I undoubtedly would have taken it. The red line is our route from the parking lot; the blue line is our route back. In the end, Zach said he had a good time. We did get to see part of the preserve we hadn’t intended to, and it was pretty and shady. I didn’t get all stressed-out. Instead I relaxed, smiled, and enjoyed a lovely morning with my son. Sadly, this wasn’t the longest experience I’ve had being lost. One night I walked around the Mission district in San Francisco for an hour because my friend and I were so engrossed in our conversation I failed to notice we had walked past my car during the first block. My son Zach is very big for his age and always has been. Obviously, when our daughter Kaylee was born, we told him to be gentle with her because she was just a baby, and he could easily hurt her. Over the past three years, he has been gentle with her for the most part, only infrequently pushing or tripping her. Now, he’s six years old, a foot taller than her, and over 20 lbs. heavier. He still follows our edict to be gentle with her, but I’m noticing that it’s having effects I never intended. Kaylee knows that Zach will not hit her back, so she’s been hitting him a lot lately, completely unprovoked, seemingly just because she can. When I tell her to stop, she just keeps hitting him until I pick her up and put her in timeout. After doing this for a few days in a row, I realized what I’ve been doing is clearly not effective. So, today, while Kayle was still hitting him, I asked Zach if he thought it was okay. He said, “No,” so I told him to tell her that, and to tell her to stop. It surprised me when he started laughing as he said half-heartedly, “Stop it.” Of course, she just kept hitting him. I told him to say it more sternly, and he laughed again and said it just as weakly. I took Kaylee away and put her in timeout. I went back to Zach and explained that if he doesn’t say, “stop,” like he means it, other kids won’t think they really need to stop. I explained that laughing makes it seem like he’s having fun. I suspect that he’s laughing because he feels uncomfortable being stern or loud. I yell loudly when I’m angry, and I’m worried now that he thinks it’s always bad to yell. I had him practice saying, “I don’t like it! Stop it!” a few times. I told him it’s okay to stand up for himself and let other people know when he wants them to stop. As soon as Kaylee’s timeout was done, I kept her seated in the chair, and reminded her that hands are not for hitting, hitting is not okay because it hurts people, and Zach might get so mad that he might hit her back. I said that if she wants to hit something, she can hit a pillow. I asked her to say, “No more hitting,” and she did. I know she’s only three, but I think it’s important to keep reminding her that she’s old enough to follow the rules. She’s been getting away with a lot because she’s the baby, and she’s cute and stubborn, but I‘m not comfortable with Zach having to carry the burden of having all of the good behavior. She’s old enough to bear more of the responsibility for them working things out and getting along. I’m going to keep role-playing with Zach to say with authority, “I don’t like that. Stop it!” I’m going to remind him, your voice isn’t only to be kind to people, it’s also to stand up for yourself. I’m going to remind myself to use my voice with authority when I want the kids to do something, but not to let my temper get the better of me to where I’m using my voice to scare them or make them feel bad about their behavior. I got yelled a lot as a kid by my father, and I have a lot of unlearning to do, but I see how much my kids can benefit from my working on this. Do any of you deal with this with your own kids where one is afraid to stand up to the other(s)? How do you help each kid work on being more effective or kinder?